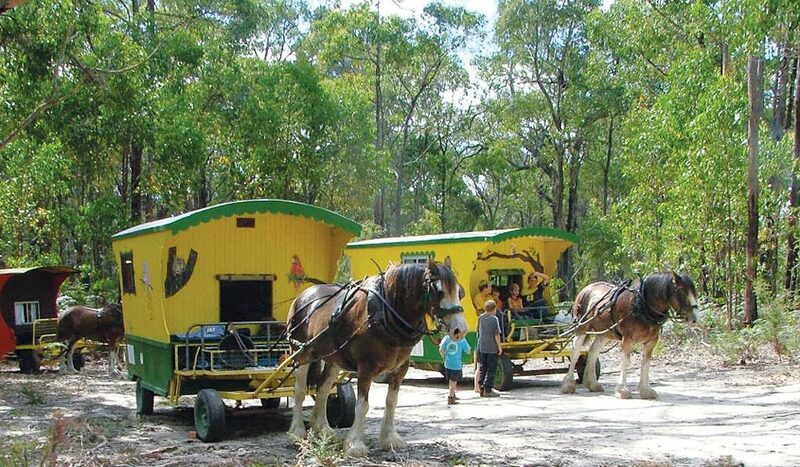 The perfect family holiday, mosey along behind your very own Clydesdale. If you like to mosey, then this hobbit-like experience is probably the pick of them. The Colonial Way wagons are, as the name suggests, old style wooden caravans fit for Frodo, Sam, Merry, Pippin and any other fellowship you care to name. Sitting in your wagon, you’ve got your massive Clydesdales up front carrying you through the secluded and tranquil camping sites of this bucolic Victorian countryside. This is varied country for the traveller (or mosey-er), where rivers trickle and bubble, hills are climbed gently, and forests are wandered through at your own pace. In the immortal words of Darryl Kerrigan from The Castle, “How’s the serenity?” Each wagon sleeps up to five people (usually two adults plus children) and well-behaved dogs are welcome. After a steady and lethargic meander (unless you’re still moseying), you reach your pre-agreed campsite, whereupon your hosts organise your horse then leave you to it. The next morning they’re back to help hitch up and plan your day. It’s no great stretch to imagine yourself back in Australia’s pioneering days, with creeks to cross and a homestead to build. Better get cracking. DID YOU KNOW? // The silky hair on a Clydesdale’s leg is called a “feather” and protects the horse’s vulnerable hoof and fetlock area from common infections and skin conditions. Scottish farmers reputedly created the Clydesdale by selectively breeding their own stock with imported Flemish stallions in the early 19th Century.